Dresses for women; Butterick’s Delineator magazine, March 1924, p 27. Two Butterick pattterns for women, March 1927. But during the immediate post-war Twenties, women’s clothing actually became longer, although less bulky and more revealing of the body under the clothes. Butterick patterns for women, Delineator magazine, March 1924, page 27. A reaction to the trauma of the First World War created “the Lost Generation” as described by Fitzgerald (in The Great Gatsby, published in 1925) and Hemingway (in The Sun Also Rises, published in October 1926.) Both were writing in the post-war period from 1924 to 1926. Fashions from those years may not look like “the Roaring Twenties” as we often imagine them. Left, a draped dress from March 1927 which looks very “Twenties” to a modern eye; right, a draped dress from March 1924 — just three years earlier. Both are Butterick patterns featured in Delineator. Which changed first: the fashions, or the women? 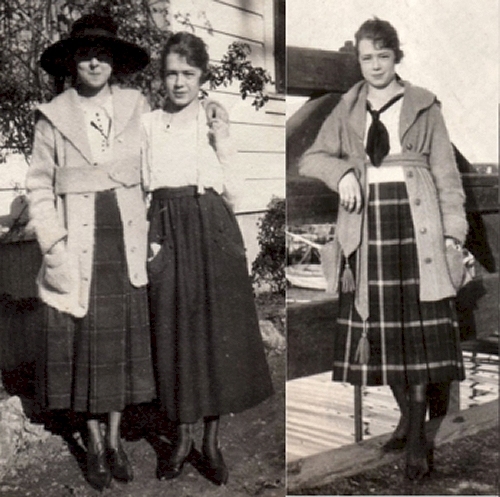 Less formal clothing from 1927, left, and from 1924, right. Butterick patterns from Delineator. What a difference three years made! Butterick patterns for young women, March 1924. Delineator, page 29. Clothes for young women and teens; Butterick patterns from March 1924. Delineator, page 29. Buttterick patterns from Delineator, March 1927, page 22. Butterick patterns for women, March 1927. If you want more details about those eight dresses from 1927, click here. These youthful outfits from 1924 look fussy and rather stodgy, compared to the streamlined styles of 1927. Butterick patterns for teens and small women, March 1924. Delineator. For more about dresses that combined different shades of the same color, click here. For more examples of rapid change in 1920’s fashion, click here. A coat (1318) and dress (1323) from Butterick patterns, March 1927. Delineator, page 25. They’re like shingled hairstyles: short and sleek.